Everything lotus must be zen! 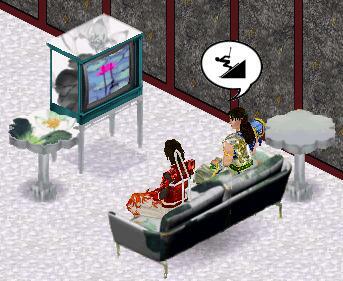 Click on the room views to download the Sims 1 Lotus Living Room. Or download each object individually by clicking on each object shot. These Asian-style objects are all created by Expression (me!). Remember to read the description for Expansion Pack requirement and other awesome info! Love the lotus? Let the lotus love you back! With the Lotus loveseat, you will feel lots of love whether or not you are truly loved. Need distraction to prove your meditative attention? Turn on the silent Lotus TV! It is so small and out-dated that you will not bother looking at it while you meditate. No sound, allowing you to sleep with it on, and give you full fun bars when viewing. Fun for all sims! Pissed by pests during your meditation? Let the quiet chi of lotus repels all pests from your abode. Oh, you mean those buzzing pests are your meditative friends? Never fear, we offer a regular no-no-pest version of the lotus end table. Either way, we shall pocket your money!